I said it on Facebook, and I'll say it again here: The state flag is ugly, looks like someone threw random paint at a cloth, and was probably designed by the same person who drew the state's borders. That said, I prefer the 1812 plates. I'd been holding off on re-ordering my vanity plate after getting a new-to-me car so I could use the money for bills. Now that I know they'll be issuing this atrocity, I'm going to take action so I get my vanity on the 1812 plates, which I prefer. I'd previously had it on the Chesapeake Bay plates, because the 1812 plates hadn't come out yet when I moved to MD and I don't like the crest plates (again: state flag). Although I do support cleaning up the Bay, I'd rather not have a mandatory $10 annual contribution, so I'd like to get the 1812 plates. A friend of mine in the license plate collectors' community has obtained a sample plate in the new design announced yesterday (with the same "MD PROUD" lettering), and it is flat. I don't like flat plates, because they can very easily become covered with mud, snow, et cetera, and therefore become illegible, defeating the primary purpose of a license plate which is to uniquely identify a specific vehicle. Specifically, I've seen this happen with both Iowa and Montana plates, which are now flat. At least if the plate number is embossed (or debossed, as in the case of Vermont), the number can still be read if the plate is dirty, covered with mud or snow. I really hope MVA hasn't decided to produce these as flat plates. It may be cheaper for the state, but there are definitely legibility concerns. The MVA did say on Twitter that the plate will NOT be flat. It will be embossed like all other Maryland Plates. It looks like they're continuing the lettering series from the War of 1812 plates. I saw three yesterday and they each have the letters CP, which is about where the War of 1812 plates were. Yep. They're numbered just like California. Cpz should be pleased. They're going to keep using 1812 plates till the stock runs out in other areas. I got my hands on the new general issue yesterday, and it is indeed embossed, not flat. But the sheet metal is as thin as the 1812 plates. War of 1812 plates run through 7C/N9999. The MD Proud base starts at 8CN0000 (no stacked letters anymore). So they are continuing the numbering format. Not just like California. If they were, the new series would have started as something like 1 AAA 001. Alternatively, I also like the Ontario sequencing of tag numbers, like AAAA 001. I have not had to change plates in a very long time, so I have no feel for how thick or thin the metal blanks are (my F250 has a set of Bay plates from 1986), and my Honda Pilot has class "M" plates from 2007. Honestly, how can this plate not make Marylanders proud to be Marylanders? We probably love our flag more than any resident of any of the other 49 states love their flags. Meh. Our state flag looks like someone vomited on a cloth. I'll agree with the second part...there does seem to be a lot of pride about that flag. The first part though? I don't know of many people where a general license plate makes them proud to be a citizen of their state. It is distinctive and dignified and combines the heraldry of the founder of Maryland as a province, the family of George Calvert, first Lord Baltimore and his Mother's family, the Crosslands. Details here. Compare and contrast with our friends in Virginia, where they took the obverse of the Great Seal of the the Commonwealth of Virginia (and it is a great seal) and and just slapped it on a blue background. IMO state flags need to have more than just a replica of the state seal. Other state flags that I like include Alaska, Arizona, California, New Mexico and South Carolina. It is distinctive and dignified and combines the heraldry of the founder of Maryland as a province, the family of George Calvert, first Lord Baltimore and his Mother's family, the Crosslands. Which is why he and his descendants worked hard to make Maryland a colony where people could practice there faith without interference from the government - initially for Catholics and Protestants, later extended to Jews. These were radical concepts in the 17th Century. All I know about NJ is our flag is beige. I think. edit: Oh, hey, it has a horse head on it. That's neat. Hey, that matches the "classic" New Jersey license plate colors of black on a beige background. As long as the horse is not a "fugitive from a glue factory," I am fine with that. I like Maryland's flag. I don't like the implementation of the new tag design. From any distance, the flag pattern looks like a smear of mud across the bottom of the license plate. Also, the flag pattern unnecessarily extends into the space occupied by the registration serial and thus does legibility no favor. Also why New York plates are often blue on that hideous orange, or the reverse. "Official" state colors as on the state flag and state seal. The reverse? I don't know if I've seen that. The blue-on-orange is a recent development. What was interesting is that people had the option to get the new orange plates; it wasn't mandatory. Some people jumped for the chance, while others held onto their blue-on-white plate as long as they could. Gold on blue was used up through 1973, at which time the colors were reversed. Oh, old plates. Thought he was talking about more recent developments. I think that's the first time NY allowed that, as opposed to the statewide replates with the 1986 Statue of Liberty base and the 2003 Empire State blue-on-white base. The 1986 statewide replate seemed to take a long time. I was a kid, maybe 6 or 7 years old, and it seemed like my parents weren't getting the Statue of Liberty plates whereas everyone else did. They first appeared in 86, yet the plates didn't come to us until mid-to-late 1987 (the fact that we moved in December 1986 might have had something to do with that). 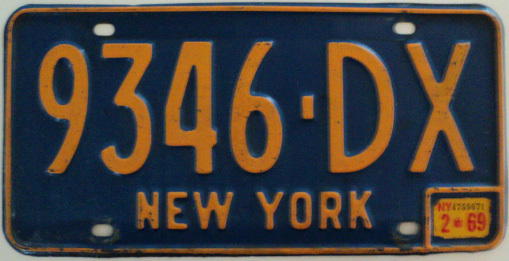 I remember on the 1987 registration windshield stickers, both the blue-on-orange and the Statue of Liberty plate numbers were both printed. Every time NY has changed bases, they've offered an extra cost option to keep your old number on the new base, turning it into a vanity plate. That's why you'll see 1970s and 1980s numbers on the newer bases, too. I seem to recall that New York had a blue-on-orange series of tags sometime in the 1960's. Alternating years between 1925 and 1963, but the letters were black. Blue on orange didn't appear until the 1973 base. My dad got the MD Proud plates for his company car!!! He loves the Maryland flag a lot, so it was only a matter of time. As far as state flag pride, Texas is the only state that gives Maryland a run for its money.